Christmas is my favourite time of year as you see all the different places around the world getting festive. In the UK there are a small number of different Christmas markets that I’ve been to, each year I try to visit a new one. This year I’m going out of the country to experience the Christmas markets for the first time as I travel to Bruges and Brussels in Belgium. In this post I’m going to talk about the different markets that I’ve been to in the UK. A city I have visited twice at Christmas time and both times have not disappointed. A city which gets in to the festive spirit in the best way possible as you can take a stroll around the markets located in a few different spots. Also take a walk down George St as you see the different buildings that are decorated festively. This year the markets are running from 16th November til 5th January. East Princes St Gardens is the main area of the four different areas as it’s where most of the attractions are as well as markets. Here you can find various market stalls selling food, drinks, decorations, clothing as well as a range of other items from around Europe. If you wish to go on some rides there is the option to go on the big wheel, star flyer or carousel. For any children that you may have Santa Land is the perfect area of East Princes St Gardens to take them as they are to explore the Christmas tree maze as well as go on some rides including helter skelter, Santa train and a mini rollercoaster. If you are someone who likes ice skating then St Andrew Square is the perfect place to go to as this is where the ice rink is located. Those wishing to visit the grotto can find it at Castle Street as well as a balloon ride. Each year in Edinburgh they have a light show. This years light show is slightly different as its a silent light event. You are given a set of headphones which play music to an array of 60,000 synchronised lights. This is located on George St where there is a charge of £4.50 with 50p going towards One City Trust. I have been to a light show on a previous visit and it is something I would recommend visiting as well as pre-booking. The Christmas markets at Liverpool are only small and located at one place which is outside St George’s Hall. You are able to find cabins serving food and drinks as well as selling a range of gifts. Liverpool Christmas Markets at St George’s Hall run from 16th November till 23rd December. There is also the ice festival located at Pier Head which runs from 10th November to 6th January. There is also the option to enjoy some ice skating on the indoor rink which costs £12 for adults. For both adults and children there is the chance to take a slide on the ice slide where you get three slides for £6. This year I have been to Manchester Christmas markets for the third time. There are over 300 stalls which are spread across the city centre as part of a trail which can be followed. Located at Cathedral Gardens you can find the Ice Village which includes ice sculptures as well as the opportunity to sit in Santa’s ice armchair or to take a selfie in an ice block. You are also able to go ice skating. There is a fee of £9 to go into the ice sculptures. Manchester Christmas markets are famous for having a giant six tonne Santa, which is affectionally known as Zippy due to its likeliness to the rainbow character. This is located at Albert Square where you are also able to find a number of stalls serving food and drinks. At Manchester markets you are able to get a mug which you are able to return or keep for the cost of £3 and makes the perfect souvenir of a trip to the markets. If you do choose to give the mug back you can redeem your £3. If you are a fan of karaoke there are karaoke huts located around Spinningfields Square and Crown Square. Manchester Christmas Markets run from 9th November till 22nd December. Winter Wonderland is suitable for people of all ages, you can go as a family or as a group of friends or as a couple. I’ve visited Winter Wonderland once and it is somewhere I would like to go back to, hopefully next year. Those who are visiting as a family will find Santa Land the perfect part for children as they will be able to visit Santa in his grotto. There is also the opportunity for them to go on an ice slide, ice trike trail as well as some small rides. Located within Winter Wonderland there is a giant observation wheel which allows you to see for miles across London. There is also the opportunity to go ice skating where you are able to enjoy a 50 minute session on the ice rink, this can be booked online. At magical ice kingdom there are ice and snow sculptures for visitors to admire. There is also the chance to visit the ice sculpting workshop which has a minimum age of 12. If you are going as a group of friends the Bavarian Village is the perfect area to visit where you can find chalets, bars and restaurants. 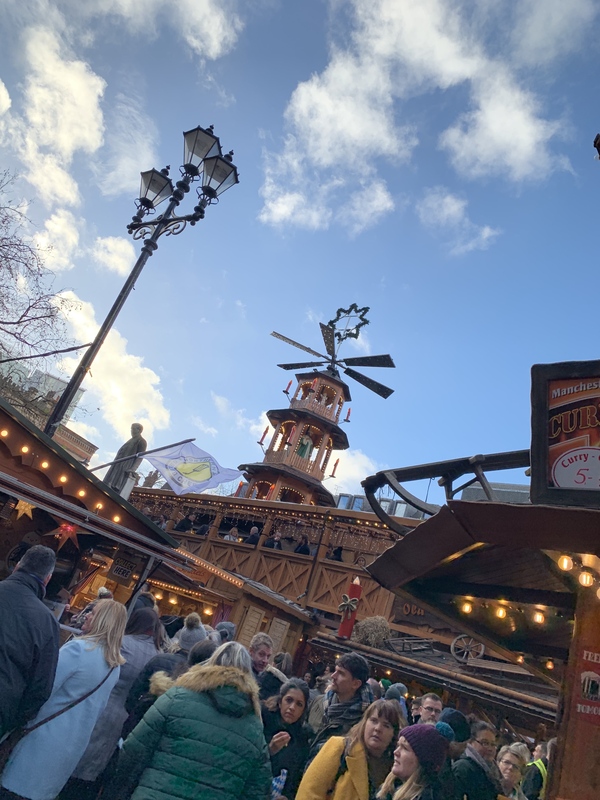 You are able to enjoy a bratwurst with some mulled wine or German beer. This is the perfect place to enjoy an authentic Oktoberfest experience. Are there any Christmas markets in the UK that you like to visit?